Glen Schofield, co-founder of Sledgehammer Games, says that game design is filled with "eureka" moments. Glen Schofield is probably best known as the creator and executive producer of Dead Space, though he is fairly prolific in the game industry as the co-founder and General Manager of Sledgehammer Games, which co-developed Call of Duty: Modern Warfare 3 alongside Infinity Ward. Before all this, though, Schofield was trained as an artist, earning a BFA from Pratt University. "I've been creative my whole life. It's all I know," he said. The core principle in his 2013 D.I.C.E. Summit presentation seemed to be the notion that "it's not about the talent, it's actually about the idea." Making a game consists of many, many "eureka" moments, where inspiration strikes and you're able to get something to work. 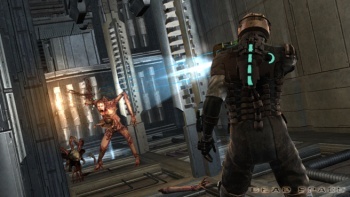 One example he gave was the inspiration found in mass transit for a sound effect in Dead Space, where the subway system in San Francisco, California emits a terrifying sound when going under the bay. This noise was used to great effect in an otherwise innocuous scene in Dead Space, where there was apparently nothing in a particular room, "no enemies, no danger, no nothing. Because we bookended it with no sound, you just open the door and you'll just see people run through that." Schofield also spoke at length about the role of research in making games. As an example, Schofield explained how he watched upwards of 400 various horror movies from around the world in his study of the horror genre for Dead Space, which puts even my own horror film marathons to absolute shame. Not only did he spend hundreds of hours scaring himself witless with various scary movies, he also researched horror and sci-fi in every medium he could find, from books to comics to blogs. "If it's important enough to get in your game, it's important enough to study," Schofield said, suggesting that there is no substitute for hands-on experience in game design and development. In their research for the zero-gee scene in Modern Warfare 3, for example, team members from Sledgehammer Games actually took a zero-gee flight to get a feel for the experience, which they could then relay to the players in game. Schofield also mentioned how his team's "audio guys made friends with the Blue Angels," who would then "fly their planes directly over them so we could get all that sound" for use in Modern Warfare 3. At the end of his presentation, Schofield's parting advice for aspiring designers was that you "Go deep, keep your mind open, because you're going to be real surprised at what you find when you do." Given the apparent breadth of his research for Dead Space, this is certainly advice that he takes to heart.